Offering you a complete choice of products which include oxygen gas analyzers, nitrogen analyzer and nitrogen dioxide analyzers. 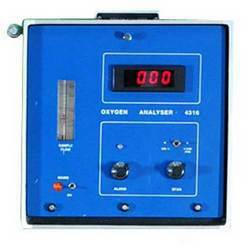 The company has emerged as a highly reliable Manufacturer, Exporter & Supplier of Oxygen Gas Analyzer. The company offers the best quality Oxygen Gas Analyzers and Percentage / PPM Gas Analyzers that are bench top versions with long-lasting sensors. The efficient performance of the Digital Oxygen Gas Analyzers has been widely appreciated across the industrial sector in the world.